The New York Knicks got off to a slow start this season with a 3-8 record. I don’t know what happened on that flight from Denver to Sacramento but since their loss to Denver on November 16th, the Knicks next have won 13 out of 14 and are currently on an eight game win streak. 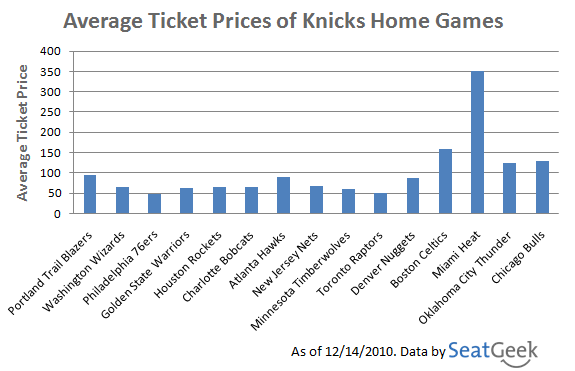 The price of Knicks tickets has been on the rise ever since the start of the season however none of their home games have averaged over $100 per ticket; the most expensive home game to date was the home opener against the Portland Trail Blazers which had an average ticket price of approximately $95. The Knicks’ next two games are against the two teams in the NBA who are just as hot as they are, the Boston Celtics (currently on a 10 game win streak) and the Miami Heat (currently on a 9 game win streak). Ticket prices for these two games are the highest of the season. The average ticket price for the Knicks vs Celtics game is $159.60 while fans are paying over double that, $351.93 per ticket on average, to see the Knicks take on Miami Heat and “The Big Three”. While it is obvious that if any of the Knicks’ home games were to average over $100 per ticket it would make sense that it would be against the Celtics and the Heat but the next two home games, against the Oklahoma City Thunder and the Chicago Bulls are also averaging over $100 per ticket. 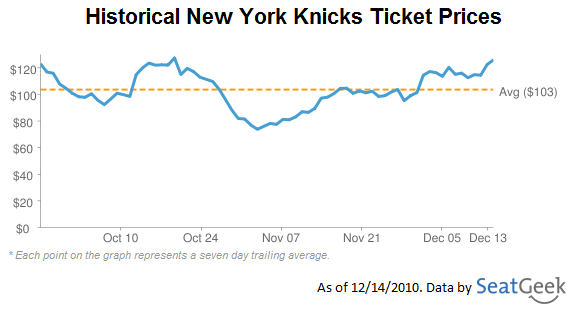 Maybe Knicks fans are paying more for tickets not only because of the hot streak that the team is on but also they also might be factoring in the Carmelo Anthony trade rumors and the fact that if he becomes a New York Knick ticket prices will most likely be on the rise. If you’re going to any of the Knicks upcoming home games let us know in the comments or on Twitter @SeatGeek.